What's a 3D Baby Carrier? From as early as 3 months, little babies start teething and it’s natural for them to want to chew on everything. Our innovative design covers the two shoulder straps and the top of the carrier to provide ultimate protection (especially when forward facing) for your HIPSTER™ PLUS 3D baby carrier. Not only does it give your baby a safe teething surface, it also keeps your carrier clean so you don’t have to wash your carrier so often. Keep two front drool pads in rotation for a germ-free space for your baby every day. Ultimate coverage to keep your carrier clean and dry. 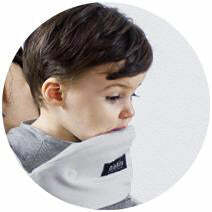 Ideal for teething babies, our cotton is soft to touch and super absorbent. Durable snaps make it easy to put on and off. I love the idea having this drool when my baby started teething.Easy to wash and can't wait to use it.A must have. I absolutely love my new MiaMily hipster. It's not only stylish but very well engineered. My baby will be using this carrier for a very long time! Like others have said, this is a must-have accessory for the Hipster! Now that I have a little teether, this drool pad is a lifesaver. It's super easy to snap on and off of the carrier for cleaning and it covers a large area! The fabric is super high quality and thick, too. So worth it. If you are thinking about purchasing the Miamily carrier without this key accessory, think again!! 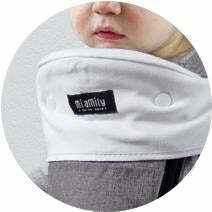 The drool pad may not seem like much, but it is everything when it comes to this carrier! When the drooling kicked in for our little one, the drool pad was the only thing that would keep him and the carrier dry. I have made the mistake and worn my carrier without it and definitely regretted it later when the whole front of my baby and the carrier was soaked. 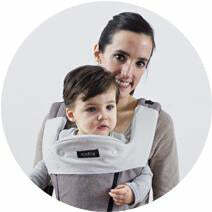 Plus it is great for the baby to teethe on without messing up your carrier and it is removable so you can wash it as much as you like. We love this little addition to our carrier!!! MIAMILY © 2019. All rights reserved.